Anchorage – Representative Louise Stutes (R-Kodiak) is calling on local, state, and federal officials to work quickly to repair the heavily degraded Larsen Bay Dam before a catastrophic failure jeopardizes the primary sources of drinking water and electricity for the small Kodiak Island community. The concrete channel that controls the flow of water into the reservoir is quickly eroding, sparking fear of a total failure of the dam structure. Such a failure could impact the very existence of Larsen Bay as a community. 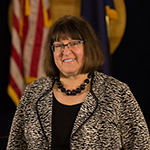 Anchorage – Today, Alaska Governor Bill Walker signed legislation sponsored by Representative Harriet Drummond (D-Anchorage) to improve the workforce training programs in Alaska. House Bill 221, which passed the Alaska Legislature with broad bipartisan support, tasks the Alaska Commission on Postsecondary Education with using a statistics program to gauge the effectiveness of Alaska’s workforce training efforts and to identify coverage gaps. Juneau – Today, Alaska Governor Bill Walker signed legislation sponsored by Representative Matt Claman (D-Anchorage) to improve public safety, provide safer neighborhoods for Alaska’s families, and protect the state’s medical professionals. “House Bill 312 passed by near-unanimous votes: 19-0 in the Senate and 31-1 in the House. The vote shows the Legislature’s recognition that justice reform is working. We rejected arguments to repeal and replace past legislation and favored balanced monitoring and review focused on improving public safety,” said Rep. Claman. Anchorage – Alaska Governor Bill Walker signed the Fiscal Year 2019 operating and capital budget bills into law today during a ceremony in Anchorage. The governor also signed legislation instituting a percent of market value (POMV) system for the use of earnings from the Alaska Permanent Fund. Anchorage – Today, Alaska Governor Bill Walker will sign landmark legislation into law to implement proven reforms to Alaska’s overburdened foster care system. The two-year process to successfully pass House Bill 151 concluded in the final days of the Second Session of the 30th Alaska State Legislature. Gov. Walker is scheduled to sign the bill today at 1:00 p.m. during a ceremony at the UAA Child Welfare Academy located at 1901 Bragaw Street in Suite 105. The Governor will be joined bill sponsor Representative Les Gara (D-Anchorage), who grew up in foster care, and dozens of current and former foster youth, including several youth preparing to attend the University of Alaska in the fall.